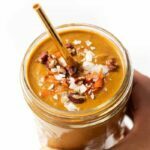 Rich, creamy and smooth, this carrot cake smoothie is like having cake for breakfast, but only healthy. Packed with fruits, veggies & tons of nutrients! Two of the things I love most about (my food) life? Smoothies and veggies. And it seriously lights me up when they're together as one power-packed, nutrient-dense meal. But let's be real, the thought of veggie smoothies really isn't that appealing. So what we're doing instead is creating a dessert like smoothie that just so happens to be veggie based. 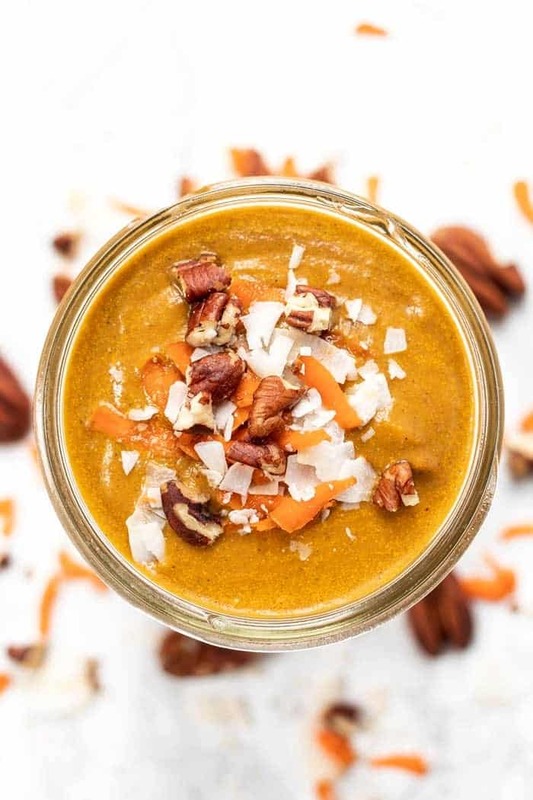 What better combo than to create our own healthy version of a carrot cake smoothie, sneaking in two types of veggies and it still tastes like a treat! Thank goodness for my Vitamix. Having a high-powered blender has changed my life. I use mine multiple times a day, every day, and it's one of those things that I can't imagine living without. 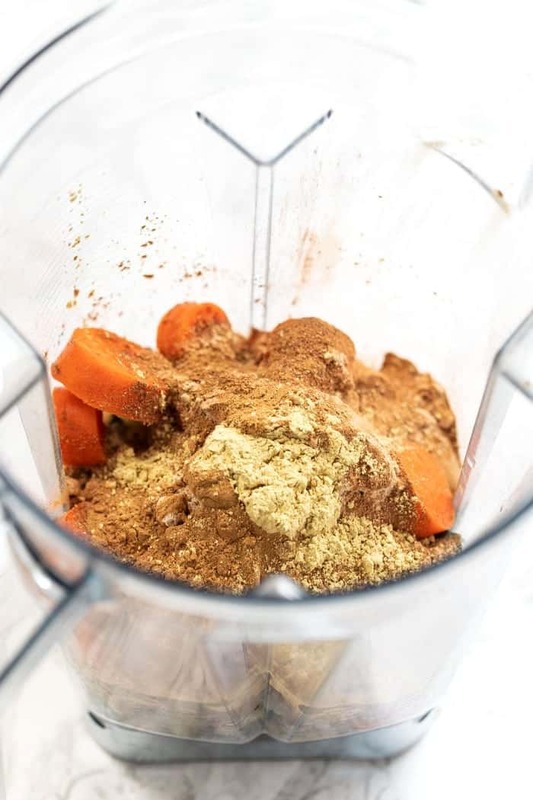 Before owning a high-powered blender, I would never have considered throwing carrots (or frozen cauliflower) into a smoothie. And while I know the price can throw some people off, the texture you get is unmatched. 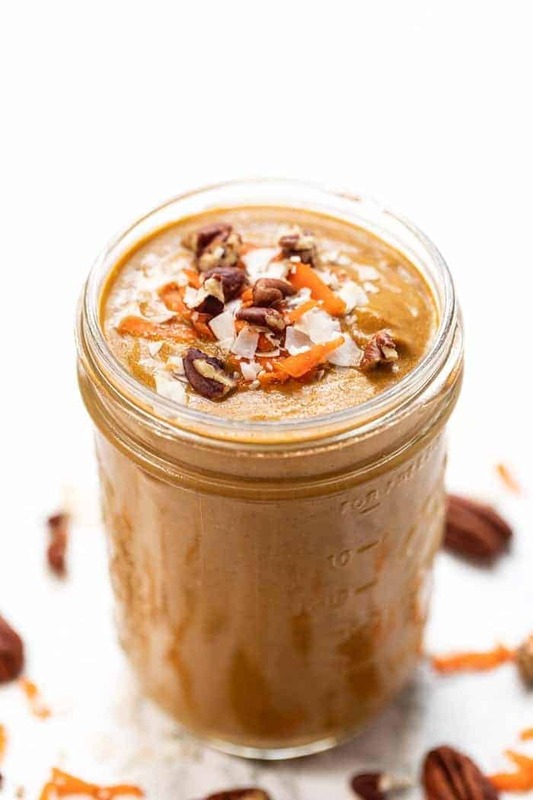 This carrot cake smoothie is rich and creamy, and everything that a smoothie should be. A silky smooth beverage that my old blender would never have been able to create. And not to mention, it tastes like a piece of cake in a glass! I'm very particular about my smoothies. It's all about texture for me. Some people like thin smoothies that you can sip almost like a juice (ahem, Matt), but I'm the exact opposite. I eat pretty much every single smoothie with a spoon and some sort of topping. Most of the time, my smoothies are my meals, so I want my smoothie to actually fill me up and keep me satisfied. Having a thick smoothie takes me longer to eat (I drink thin smoothies in like 30 seconds) and I almost always putting toppings on, so I end up feeling pretty full after my meal. I also love that they make me chew! We all know that chewing our food is super important for digestion. When you have a “drinkable” smoothie, you're not really chewing, just swallowing. That's why I like them thick and with toppings – I end up actually chewing them! Whether it's breakfast, lunch or dinner, smoothies always hit the spot, especially when I make it a point to make them feel like a real meal. Which ultimately means it's got to be thick, velvety and smooth. Like soft serve ice cream! So, what sparked the carrot cake smoothie idea (aside from my adoration of all things involving carrot cake)? Simply put, I had carrots in my fridge, wasn't feeling the green smoothie vibe, but still wanted something filling and fiber-rich. And I figured since I have a super powerful blender, why wouldn't it whip carrots into a delightful beverage? And yep, you guessed it. It totally does. I mean just LOOK at that texture! Plus, who wouldn't love eating something that tastes like carrot cake but is actually healthy?! I know I would! 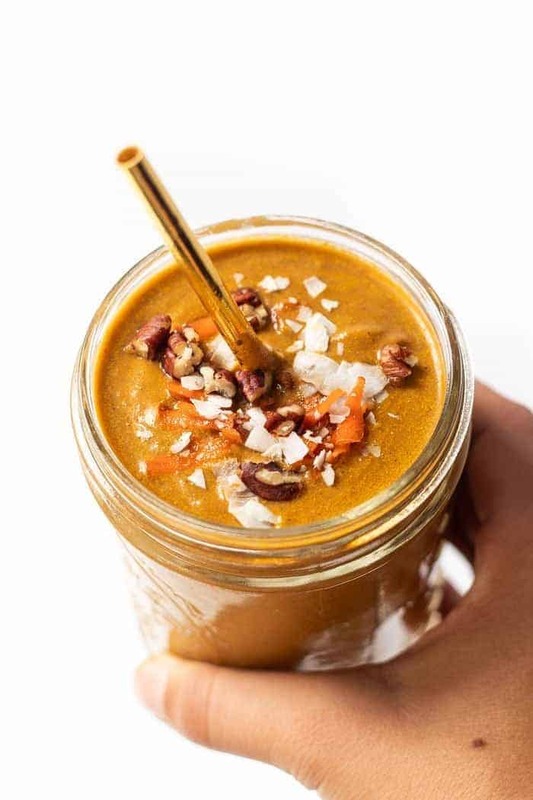 This healthy Carrot Cake Smoothie is a delicious way to sneak in some veggies to start your day! Add all ingredients to a high powered blender in the order listed. Blend on low for 1 minute, then turn to high for another minute, or until completely smooth. Pour into a glass, garnish with shredded carrots, coconut flakes and/or a sprinkle of cinnamon, and serve. Enjoy! I LOVE your recipes. But I can never find the individual PIN button. I end up putting them all to word docs and printing them out. Surely there’s an individual PIN button for each recipe so I can follow it on my Ipda? This looks really delicious. I have a question, though. There is mention of broccoli slaw in the comment section. Has the recipe changed over time, or am I just missing something, because there’s only carrots and cauliflower in the recipe, for veggies added? Also, lately I’m seeing a lot of recipes using frozen cauliflower in smoothies. I always wonder whether the frozen cauliflower is cooked or raw. The recipe has been changed over time 🙂 I buy frozen cauliflower that is pre-cooked actually! I recommend either finding a frozen, quick-cook cauliflower (that usually means it’s pre-cooked), or steaming yourself then freezing! Why is ir better to have everything frozen? Is it more jummy this way? I am not sure I want ice-cream in the morning… But maybe there is another reason? Because it makes it cold 🙂 If you don’t want a cold smoothie, you could use fresh! I don’t own a Blendtec and have no intentions of getting one (maybe a weddling list item someday) but in the mean time was wondering if you could offer a suggestion for making this with a regular blender. I own a food processor too so I was thinking I could just mash up the carrots in that and transfer it over. Tedious perhaps but I’d really like to try this. Love your recipes. I just wish you show the nutrition breakdown. Thanks for the comment Jerry and I appreciate the feedback. I don’t calculate the nutritional content for my recipes because I don’t find that many of my readers ask for it. For those that do, I direct them to the online calculators you can use by just plugging in the ingredients and everything is broken down for you. Hope that helps! Wow! I never thought to put zucchini, broccoli, or cabbage in sweet smoothies. Thanks for the great ideas. This took me more than 5 minutes to prepare, but it was worth it! Delicious and I used honey instead of stevia. Just made this morning. SOOOO good! Thanks for the recipe. Thanks, Beth! It’s one of my new favorite recipes! Wow, I’d not thought of putting broccoli slaw in a smoothie before. I might have to see if I can do this in my food processor or something. I’m not sure my little mini blender will handle it. I am very interested in your cookbook… one question though: do many of the recipes call for special ingredients that are likely only available in the States, such as protein powders and the like? I live in the land of quinoa and I love the taste of the flour in baking, but living in a rural region in Chile means I don’t have feasible access to things like that. Also, if you use a lot of coconut flour, let me know. Yes, I have coconut but not the flour and making the flour is just entirely too laborious. Thanks for the recipe, Alyssa! I love adding cabbage slaw to my smoothies too! 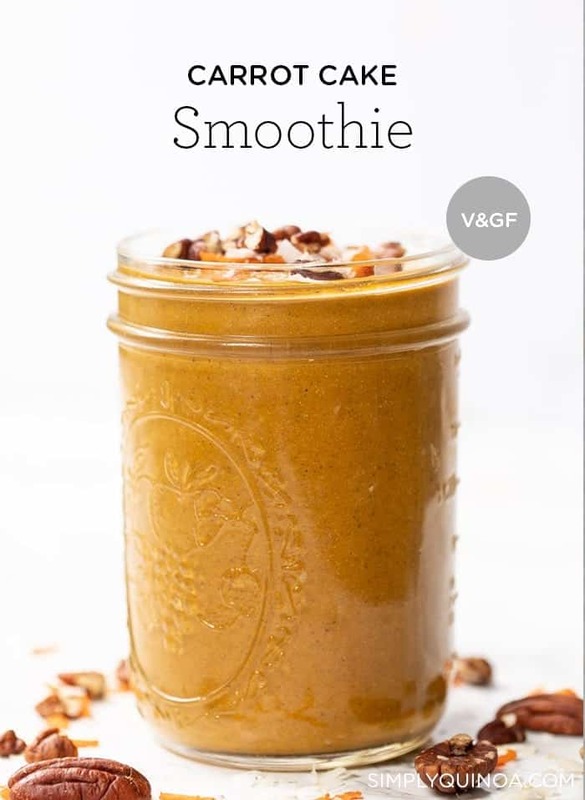 It’s a great way to add more veggies without changing the color of the smoothie itself. Whenever I add spinach and/or kale to a smoothie with berries (or carrots in this case! ), I always end up with a big glass of brown 🙂 Not super appealing, but always delicious! And doesn’t a high-speed blender just make your day? Gosh, I love mine!